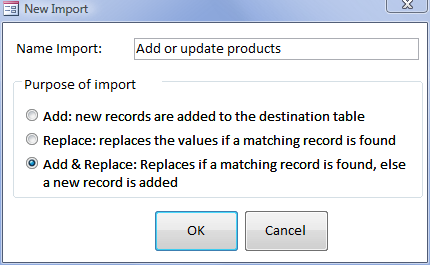 If the Import method is Add and Replace, the system uses the key to see if a record already exists. If yes, it will choose to Replace that record, if no, it will Add a new record. To prepare this demo, remove some records from the Products table, and make some changes to the records, preferable also to the Category field. Note that the table 'Products - original data' is used as a backup for the demo. Whenever you are done, you can use cut and paste on the whole table to get back the original data for Products and Suppliers. In the transfer pane, an matching is done of Source and Destination fields. Not so surprising, all fields have been matched. You can see two fields changed: CategoryID and Unitprice. As most people don't know what the category codes stand for, we will use a lookup technique. 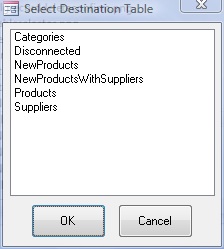 In column Lookup, enter the name of table Category. After leaving that cell, the row gets updated. The Old Value now displays the text correponding to the ID. This went ok because the table's first two fields happend to contain the values we need: ID and Categoryname. If the table had been set up differntly we would have made a query. New Value still has an ID. If we want to know what it stands for, click on the New Value popup button. You will see the current value selected. If you did your initial preparation ok, you should be able to find a new record. Use the navigation buttons to find a new record. A new record is recognized in that there are no Old Values.